Wall guards maximize wall protection in hallways, corridors, and other busy facility areas where walls are likely to be on the receiving end of high impact collisions. 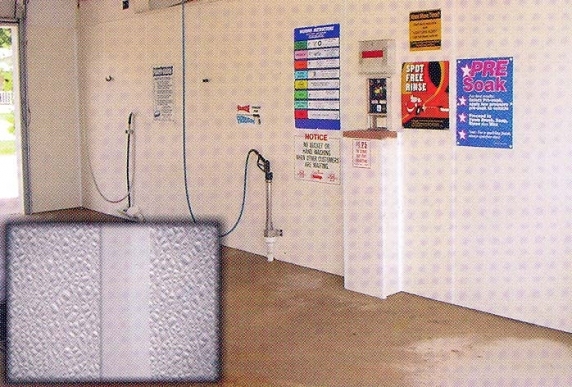 Wall guards protect against everyday scrapes, dents, and scuffs while also standing as a first line of defense against more aggressive and abrasive collisions from wheeled carts and light machinery. Our wall guard collection does more than just protect walls, however. In areas where wall damage is unlikely, wall guards extend along hallways and corridors to add texture, functional style, and eye-catching color to interior design. Our collection of wall guards has been hand selected by our facility safety experts and represents the industry’s leading materials, designs, and safety ratings. We are pleased to offer a wide range of products that can be used in a variety of different environments. Influenced by the Arawak Indians of the Caribbean and Latin America, our Arawak® Wall Guard protects walls from impact-related chips, scrapes, and dents. 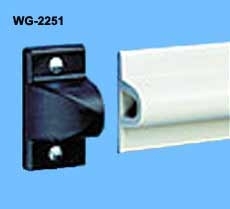 This wall guard also features a unique EZ-clip attachment system that simplifies installation labor and costs. Shawnee® Wall Guards provide standard wall protection with a decorative flare. Available in a variety of colors designed to mesh well with most interior décor schemes, our Shawnee® Wall Guards feature a rigid vinyl construction that defends walls from light to moderate impact in a variety of commercial settings. Materials: Rigid vinyl, aluminum channel. Sundance® Wall Guards have a unique half-rounded exterior that provides a fresh contemporary look, without sacrificing functionality or wall protection. With wall guard prevents impact, dents, and more with a rigid vinyl exterior that rises a full 2” high. Available with high gloss or embossed finish. Available in High Gloss or Embossed finish. Tecumseh® Wall Guards are our newest protective products for walls. Features a unique angular design with 1/2” rubber spacer for optimal impact prevention and shock absorption. Available in a variety of colors. 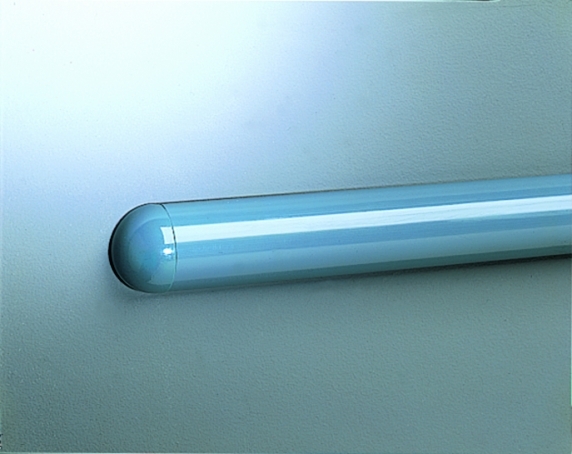 Aluminum Retainer: Channel natural anodized. Wichita® Crash-Rails are the #1 choice for hospitals, labs, food processing plants, and other commercial facilities where environments must remain sterile. 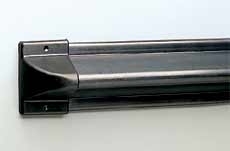 This crush rail is manufactured with sterile stainless steel to ensure “clean protection” that prevents scrapes, dents, and other wall damage. 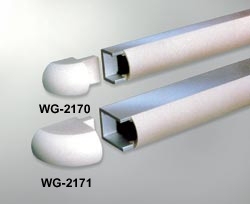 Zuni® Wall Guards extend 1 ½” outward, providing durable wall protection that is relatively low profile and discrete. With 9 soothing and muted colors to choose from, the Zuni® is a favorite among commercial facilities that must protect walls from cart-related damages while maintaining interior aesthetics. Apache® Wall Guards are a larger version of our popular Zuni® guards. Extending 2 ¼” away from the wall after installation, our Apache® Wall Guards provide exceptional protection from pedestrian and wheeled cart traffic. Built to withstand significant wear and tear, and available in a variety of lux colors to adhere to facility aesthetics. Shoeshone® Bed Locators perform a number of vital functions for hospitals, nursing homes, hospice facilities, and other centers where patient care extends overnight. 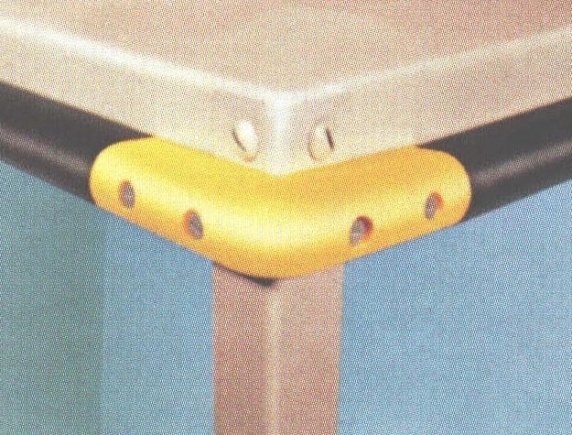 Each bed locator consists of two brackets, two molded vinyl end guides, and one standard Aztec® Wall Bumper. Together, this system prevents beds from damaging walls while also maintaining well-defined bed lines and aisles. Algonquian® Wall Guards are an economical option for facilities looking to invest in basic wall protection. The hollow and flexible construction of our Algonquian® Wall Guards enables a variety of applications in commercial facilities. Protect against unforeseen pedestrian, cart, and dolly wall damage with these simple yet effective wall guards. Maya® Wall Guards provide maximum “cushion” against mild to moderate impact. Manufactured with urethane rubber, and reinforced by an underlying aluminum retainer. 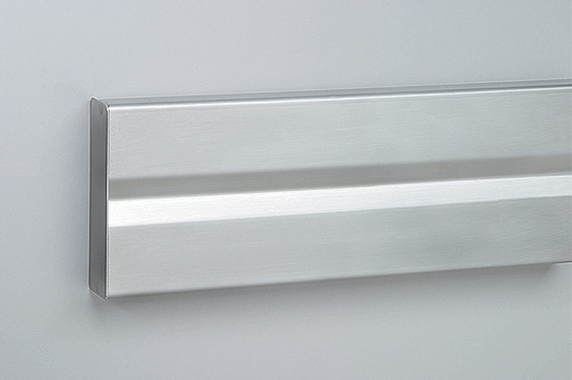 This wall guard is easy to install with no visible hardware after application. Seneca® Wall Guards and Vinyl Bumpers are popular in office buildings, retirement communities, and other areas where traditional décor exists. Featuring a wooden construction with vinyl insert, these wall guards protect against carts, chairs, and other incidences of light impact. Sandia® Wall Guards are ideal for busy commercial settings where heavy carts, forklifts, and other light machinery might come into contact with walls. Prevent severe damage with our Sandia® Wall Guards, now available with stylish vinyl inserts. Our Aztec® Wall Guards feature a unique design that provides superior protection against heavy impact from carts, dollies, and light machinery. Extending a full 1-3/4” outward, this wall guard combines subtle aesthetics with superior functionality for various commercial applications. Protect walls while preserving interior aesthetics with the Catawba® Wall Guard. This protective guard was originally designed as a cart bumper, but over the years has evolved into a handrail. A “continuous” design enables our Cheyenne® Wall Guard to be applied to unique wall surfaces, including those with contours and textures. 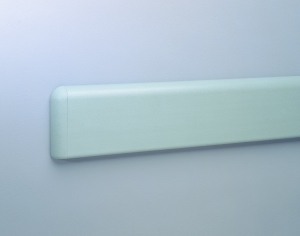 Made of Flexible Vinyl over a metal retainer, this wall guard delivers excellent protection comes in 7 different colors. Chickasaw® Wall Guards consist of an aluminum retainer enveloped in Rigid Vinyl. 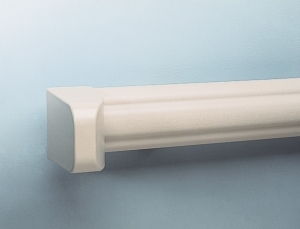 This wall guard extends3/4” from wall surface, protecting wall surface from damage. Now featuring a “spring back” design that enables superior shock absorption. 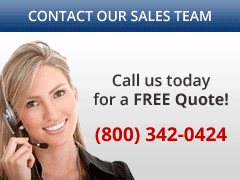 Looking for basic and economical wall protection? Look no further than our Chippewa® Wall Guard, a basic product made of high impact Rigid Vinyl. 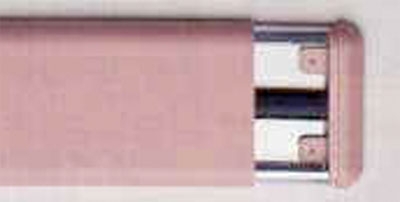 Construction features 2 hollow chambers for simple shock absorption. Hopi® Invisible Wall Guards are ideal for facilities that need to invest in wall protection that will not interfere with ornate wood paneling, custom interior wall paint, and vibrant wallpaper. 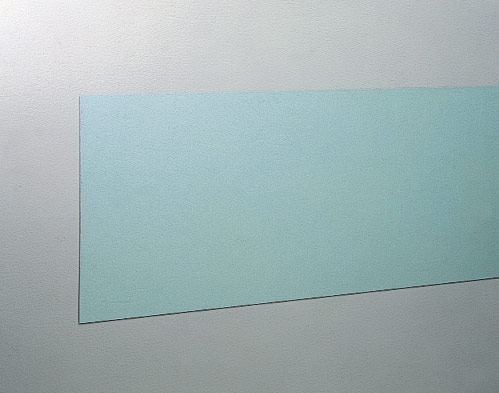 Impact resistant and made of an “invisible” clear vinyl, our Hopi® Invisible Wall Guards deliver substantial wall protection while keeping facility aesthetics in mind. Available Heights: 3" or 4"
Kiowa® Wall Guards are made with a unique crescent shape that offers basic wall protection, without sacrificing aesthetics. Reinforced with aluminum, this wall guard comes in over 55 vibrant colors to deliver wall protection without disrupting interior décor. Exterior enveloped in Rigid Vinyl. Available Heights: 5" or 8"
Navajo® Wall Guards are designed for use in a variety of residential settings, including dormitories, nursing homes, and common areas in apartments and condominiums. 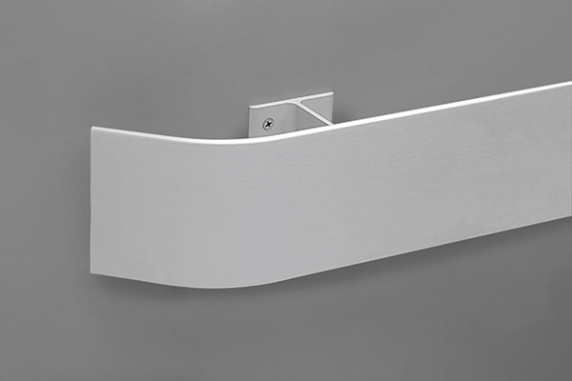 Extending 1” from wall surface, this rigid vinyl wall guard is reinforced by an underlying aluminum retainer and is designed to spring-back when hit. Available in lightly pebbled or fluted stripe surface texture. Available with Plain or Grooved surface. Oneida® Wall Guards feature a unique construction that enables this product to be used with maximum effectiveness on curved walls and columns. Made of EPMD rubber, this wall guard sits atop an aluminum retainer that can be curved to accommodate a variety of non-linear applications. Comes in black. Ideal for curved walls and columns. Pawnee® Cart Bumpers are ideal for use in facilities where wheeled carts, dollies, forklifts, and other light machinery are used daily. Measuring 1 inch thick, these rubber bumpers are built to absorb the shock of heavy impact, without allowing damage to the underlying wall surface. Powhatan® Wall Guards are among the widest of all wall guards that are available on the market. Choose from an array of vibrant colors, available with a lightly pebbled or fluted stripe surface. To save on installation and delivery, order our Powhatan® Wall Guards with EZ-clip installation system.